I am almost at the end of week two of the Park City Math Institute, and I’ve had a pretty incredible time. Morning math, facilitated by Bowen Kerins and Darryl Yong, is the most fun I’ve had doing math ever. Seriously, go check out our problem sets. They’re awesome. I’ve had a really great partner for afternoon working groups who has pushed my thinking in awesome ways — we’re working on a really fun project clarifying what it means to “look for and make use of structure” and I’ve learned a ton along the way. Really, nothing is better than spending time with a group of incredible math teachers who are thoughtful about their practice and want to enjoy spending time with other mathy folk in a beautiful place over the summer. The thing that has been bothering me is our third daily session, titled Reflecting on Practice. The focus of the session is eliciting and using student thinking — formative assessment. The class itself has been really interesting. We’ve watched a huge variety of videos of teachers, discussed the importance of eliciting student thinking, and looked at a variety of ways of doing so. There’s been a great deal of disagreement, however, as we get into discussions of what good teaching looks like. We’ve had some great conversations, both in class and afterwards into the evenings, about all kinds of issues — whether some of our judgments are helpful, what we do when we try to teach in this ambitious way and things go wrong, and whether the issues we’re discussing are important to teaching or pure semantics. Reflecting more, I feel like the central issue is that we are building a vision of excellent teaching, and excellent teaching is risky, messy, and requires a great deal of finesse and ability to deal with ambiguity. All of that means that the vision of teaching we are talking about is pretty distant from what my classroom actually looks like. As we’ve progressed through our conversations this week, I’ve come to realize this more and more vividly — I have struggled as I’ve felt my ideas pushed to the side at times in favor of more progressive and open-ended approaches to teaching — useful, of course, but more and more out of touch with what was actually happening in my classroom this year. I’ve worried this week that I won’t be getting much out of this course if it feels disconnected from what I do as a teacher, but I think I’ve come to a solution. I realized that, no matter where my teaching is, having some conversations over the summer is unlikely to make a big impact alone. No matter how clear my vision of teaching is today, it will fade over time, or fall apart when it meets classroom realities. Instead, I need to think about what I can learn here that I can take with me to my classroom, and use as a lens to continue learning and improving my practice each day — not that I walk in with amazing new ideas, but a new way of thinking about my teaching that will improve my reflection and accelerate my growth over time. 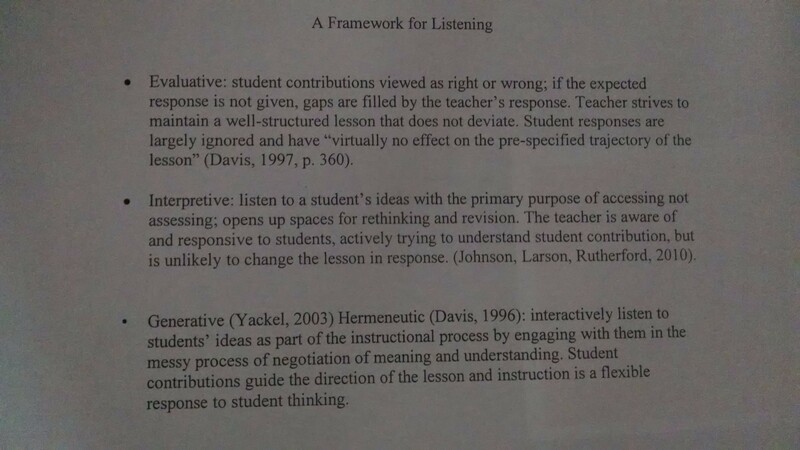 It’s a framework for listening to students, and it has caused a ton of debate here. Evaluative listening is clearly problematic, and we all want to incorporate generative listening into our classrooms — but it’s also a pretty hard thing to do, and we’ve had trouble breaking down the criteria for each type. How does generative listening square with learning goals? What do you do when a student has a great mathematical idea that doesn’t lead where you think the rest of the class should go next? Is this whole generative listening thing really a contrived, teacher-y way to lead students where you want them to go while making them think they’re in charge? How do we tease apart the teacher-is-the-answer-key element of evaluative listening from the lesson-that-does-not-deviate-based-on-student-thinking element of evaluative listening? I don’t have good answers to these questions, and I have plenty more questions to boot. But right now, I’m a lot less concerned with the conclusions I come away with — they’re likely to fade over time, especially as I won’t be in an actual classroom again for over a month. What I do have is a framework that I want to apply to my teaching on a daily basis. If I am spending my time here trying to come to a perfect understanding of formative assessment, I’m likely to be unsuccessful, or come into the classroom with unreasonable expectations. If, instead, I come away with a great understanding for a framework for thinking about formative assessment, I can use it to reflect and continually improve my practice — use it as a new lens to look at a lesson, decide what went well and what needs improving, and what a next step might be to do a little better tomorrow. This feels like a much more manageable goal to focus on in my last six days at PCMI — and, at the same time, a much more impactful way to look at my professional learning here. So, after a week and a half of mostly blogging silence with respect to my reflections on PCMI, I am hoping to refocus my reflective efforts — not on coming to any grand conclusions about the nature of teaching, but on taking a few ideas away that I can use as a perspective on my teaching, understanding those ideas as well as I can, and recording those understandings here where I can return to them once I am back in front of students. This entry was posted in PCMI on July 9, 2015 by dkane47.